Since beginning my blog at the start of the year I've had a few questions regarding my photos: what camera I use probably being the most common. I thought I'd give you the low down on my photography kit in one fell swoop! Better late than never, eh? Before I start getting into any depth about it though, I'll tell you now, my camera was not bought for blogging! I did an A Level in photography, so the camera was bought to improve the quality of the images I was producing and to prepare me for potentially studying photography at university. Personally, I don't think owning a digital SLR is at all essential to producing good photos for your blog (I actually own a £30 Samsung camera which produces some pretty reasonable photos - click here to see some edited examples). But you might get to a stage where you'd like to be able to change lenses for different effects in your photos or maybe even take photography up as a more serious hobby. Anyhow! Enough with that; here's what I use to take the outfit photos, in fact any photos, for my blog. I'll provide a link to where you can buy things and a quick overview of each product in case you're particularly interested in any of them. 1. The Body - Canon 1000D: I've used my 1000D for about 4 years now. It does everything I need it too and I've never had any issues with it (I've heard there are common faults, but any electrical product generally does). Canon are known for being a reputable and reliable manufacturer of digital SLRs and their range goes all the way from beginner / amateur cameras to truly insane, professional lumps (some of them are ma-hoosive). I've never owned any other SLR body, so this one is bound to be my favourite! 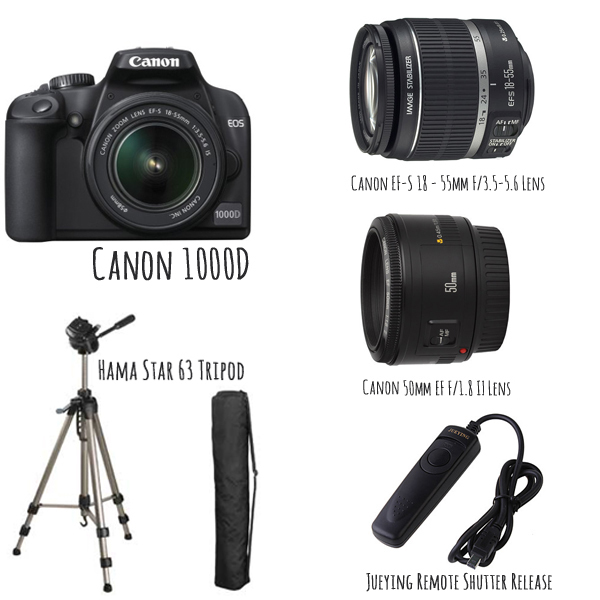 This body isn't produced anymore, but the closest Canon currently produce is the Canon 1100D, available from Amazon with an 18 - 55mm lens. You can still get the 1000D second hand on eBay and Amazon with or without the 18 - 55mm lens. 2. The Lens - 18 - 55mm Canon lens and 50mm Canon lens: The former is a decent all round lens that is, handily, deemed as the standard lens so 99% of the time it's the lens that comes with Canon cameras. I say handily as this lens is great for producing your generic outfit photo - so perfect for me. It also allows you to zoom. You can get the Canon 18-55mm lens on Amazon here. I recently bought the 50mm. I simply wanted another lens option, but also because I like the effects it can create (click here to see what I mean!). I bought my 50mm f/1.8 II on eBay for the same price it is on Amazon now (image from here). It's the cheapest of the Canon 50mm lenses; it does all I need it to! It's worth noting this lens doesn't zoom and makes you much closer to the subject - it's worth considering factors like this before diving straight into buying a lens. Check the compatibility of the lens too - imagine how annoying it'd be to buy a lush, pricey lens only for it not to fit! 3. The Tripod - Hama Star 63: A really basic, rather ugly but essential thing for an outfit / style blogger. Trust me, investing a few bob in a tripod is much better than stacking up books and cereal boxes to balance your camera on. There are good and bad reviews of this on Amazon. I've had a pretty average experience with it, reflecting the price. I bought the Hama Star 63 from Amazon about 2 months ago for just under £17 - pretty cheap! The leg extending parts on it can be a little stiff, but otherwise it's a decent starter tripod. 5. Editing Software - Photoshop Elements 6.0 & PhotoScape: I've used Photoshop itself before for a couple of years, but I can't afford that these days (...or bother finding illegal ways of downloading... ahem). I currently use Photoshop Elements 6.0, a simplified version of Photoshop. This version is old so it's not sold anymore, but the current version is Photoshop Elements 10.0, which you can buy here from Adobe for £78.15, a scratch of the cost of the real Photoshop!!! It sounds expensive, but I use it every time I process or edit my images. I also use PhotoScape, a free program, which makes it easy to resize images and carry out basic editing. I'd really recommend it. I'm hoping I've covered everything! There are a few other bits and bobs you might need, for example a camera bag, lens filters and so on, but I didn't want to make this post any longer than it already was. Feel free to ask any questions you might still have - I'm no expert but I might be able to help! Been looking for a wireless remote for my camera which is a nikon d3100 but i found out it wasn't compatible :( Gonna have to try the ones with the wire seeing as you find it okay to use. such a helpful post! the throwing the remote thing away did make me laugh! Wow, jealous of your beautiful equipment...Nice blog! You have a very easygoing style. I have the 1000D for almost 4 years now and never realized I could get a remote (I clearly didn't do that much research) so I definitely need to invest in the remote now!